Here’s another photo of Julia post-meal. Prior to this photo we scrubbed her face, hands, arms, legs, feet, seat, and table. It was on my way back to her that I decided we need another photo of her. 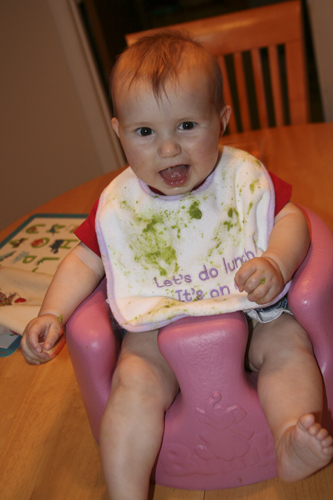 Obviously, we had been eating peas. The bib is so applicable, ‘Let’s do lunch. Its on me”. I’m allowing Julia to get a lot more messy than I allowed Emily to get at this stage. This was the first meal that we had a moment of recognition that ‘there is a spoon with food on it and I want it in my mouth’ occurred. It was brief and then she returned to the games of not opening her mouth, being distracted by everything in the room, and where’s sister.